By studying a worm that swims in bacteria, scientists believe they will gain a better understanding of our immune systems. Video and photos by Rebecca Jacobson. Dennis Kim , associate professor of biology at MIT, spends his days carefully raising worms that are no bigger than a comma. The students in his lab feed them, watching them grow and multiply on petri dishes that sit in a plastic tub. Then they infect the worms with deadly bacteria and watch them fight for their lives. But as the worms die, humans learn how the simplest immune system can stave off a deadly infection while swimming in a world of bacteria. Kim’s lab is studying the innate immune system, which is a first line of defense against infections. It’s a more primitive defense system, where physical barriers keep out bacteria and immune cells swarm to infection sites to fight off pathogens. All multicellular organisms — humans, worms, plants — have this general protection, Kim said. Humans also have what is known as an adaptive immune system. When our body is attacked by a virus or bacteria, our white blood cells develop highly specialized antibodies to attack the disease. That response can take days to kick in, and it’s up to the innate immune system to trigger it, said Stephen Calderwood , chief of infectious disease at Massachusetts General Hospital. If the immune system is weakened, either by medications, severe injury or genetic disorders like cystic fibrosis, infections can run rampant. “Some of the mortality that occurs from bacterial infections occurs very early, in the first 24 hours, and that’s a time when the innate immune system is most relevant. Antibiotics are very effective of course, but often don’t have an opportunity to interact with the bacterium that quickly,” Calderwood said. The worms, seen through a microscope, swim in a “lawn” of E. coli bacteria. That innate immune response is the first line of defense in humans, Kim said. But even without highly specialized antibodies, microscopic organisms can fend off infections. “Worms and flies don’t have that adaptive immune response, so it’s that first branch where they recognize that there’s a problem, and do what they can to either neutralize or kill the microbe with making proteins that can, for example, kill bacteria,” he said. 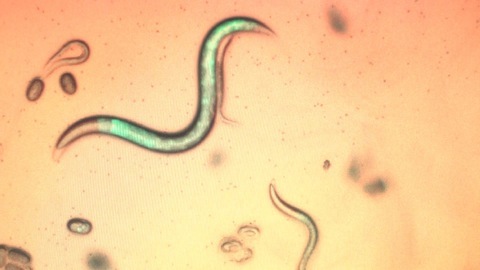 To understand how they do it, Kim’s lab has been studying Caenorhabditis elegans , usually just called C. elegans or “the worm.” It’s a tiny worm that lives in places teeming with bacteria, like soil, compost and rotting fruit. They eat bacteria; E. coli is the regular worm chow in the lab. At first glance, worms don’t have anything in common with humans. Each adult has about 1,000 cells, 302 of which are neurons or brain cells. They are transparent. They’re hermaphrodites, meaning each worm can create both sperm and eggs. That means each of its babies is a clone of its parent. Despite those differences, a third of the worm’s genes have human counterparts, said Joshua Meisel, one of the graduate students in Kim’s lab. To understand which genes affect its simple immune system, Meisel creates random mutations in the worm, then looks for the mutant worms that have an impaired immune response. And its a lot simpler to do this with worms rather than mice, he said. 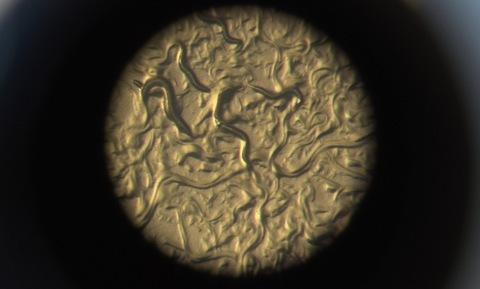 Associate professor Dennis Kim says that studying these worms may be able to teach us how to better coexist with bacteria. About 30 feet down the hallway from the lab is a room the size of a coat closet, where beakers full of greenish fluid are kept at 98.6 degrees Fahrenheit. Machines whir to keep the beakers spinning, circulating air inside the beakers to allow the bacteria Pseudomonas aeruginosa to thrive. Pseudomonas is unusual because it can infect just about any organism, Kim said. If this strain was injected into a plant, it would kill the plant. Put it in a mouse, and the mouse would develop sepsis and die, he said. 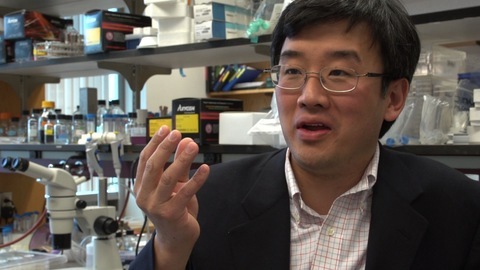 The strain of Pseudomonas in his lab was cultured from a patient across the river at Massachusetts General Hospital in the 1990s, and it remains the “scourge of the burn unit,” Kim said. Pseudomonas is one of the top five nastiest hospital-acquired infections, Calderwood said. The bacteria is in the environment all around us, and for those of us with healthy immune systems, it rarely becomes a problem, he said. But the bacteria is notoriously antibiotic resistant, making infections tough to treat, he said. In a hospital, Pseudomonas can be carried into a patient’s lungs or blood through medical equipment — breathing tubes, IVs, needles — and it’s a common cause of hospital-acquired pneumonia. It’s a nasty infection to look at in some patients, Calderwood said. For one thing, it has a cloyingly sweet smell to it. Kim describes it as being grape-like. Zoe Hilbert, a graduate student in Kim’s lab, says it smells like a dirty gym locker room. The bacteria can also create inflammation and cause infected wounds to ooze green pus. And for burn patients, Pseudomonas can be fatal. Pseudomonas kills the patient’s skin tissue, and patients wait in agonizing pain for a skin graft. “Burn wound infections with Pseudomonas can be quite difficult to look at, and obviously if you’re the patient, quite difficult to tolerate. They’re usually heavily sedated with pain medicine, obviously to keep them out of pain while the treatment takes hold,” Calderwood explained. View through a microscope of C. elegans worms that have been tagged with a green protein. One of the advantages of using C. elegans is biologists can watch how the entire organism reacts to an infection, Kim said. But the worms are see-through, and the bacteria are even smaller that the millimeter-long C. elegans. So the researchers make the worms and bacteria light up with a green fluorescent protein that is found in jellyfish. Scientists take the jellyfish gene for fluorescence and splice it into the DNA of a protein they want to study and watch it glow in the dark. They can tag specific tissues or individual cells, said Doug Cattie, a graduate student in Kim’s lab. For one experiment, researchers engineered the bacteria with the glowing green protein so they could watch how the microbes made the worms ill. The Pseudomonas can kill the worm in just a couple of days, Kim said. But the worm can win. Its innate immune response uses a protein as warning flag, signaling to the worm’s cells to mount an attack against the Pseudomonas. Studying those proteins can help us understand how humans’ immune systems deal with bacteria too. “It turns out that if you look at the proteins that are involved (in) signaling the worm, many of those proteins actually have a function in mice or human cells, in defending mammalian hosts against pathogenic infection,” he said. But what has been more surprising is that the worms learn to avoid the bad bacteria in the first place, Kim said. Not only do their bodies adapt to fight the Pseudomonas, they learn behaviors to avoid the bad bacteria. And it turns out that worms help other worms stay alive. “They’re social organisms. They make small molecules that allow them to sense crowdedness … we think, actually, some of these sort of cues are also involved in their responses to pathogenic bacteria. So in some ways, it’s a group effort,” Kim said. This is how worms survive in a world full of bacteria, Kim said. And by continuing to study how they survive and avoid the bad bacteria, we may understand how our own cells cope with a world of microscopic invaders, which, he said, outnumber our cells 10-1. But we’re really not battling these bacteria all the time. “In fact, we’re just coexisting with them,” said Kim. “Yet there’s emerging evidence that there’s some communication going on.” In other words, if a worm can avoid the bad bacteria, maybe our cells can do it too, he explained. And for those who work in infectious disease, understanding how the body’s first line of defense works could mean better survival for their high-risk patients. PBS NewsHour coverage of basic research is funded by the Gordon and Betty Moore Foundation , which also supports our regular science reporting along with the S.D. Bechtel, Jr., Foundation , the Howard Hughes Medical Institute and the National Science Foundation .